Take your beginning knitting skills to the next level with Purl Soho’s Learn to Knit a Hat in the Round Pattern! This full-color instructional booklet is for people who know how to cast on, knit, and purl but who haven’t yet learned the particular skills of knitting in the round. 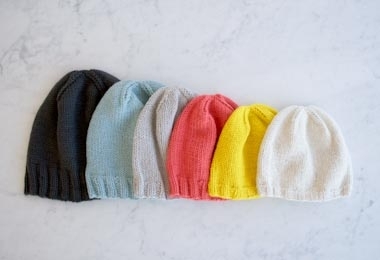 It will teach you all those skills and how to use them to knit up your very first no-seam, no-sewing, in-the-round classic winter hat, sized from Toddler to Adult Large. Choose to receive your Pattern as a PDF download or a hard copy, and for more information, including a list of materials you'll need to make your Hat in the Round, please click Product Details, above.